April 12 is the International Day of Human Space Flight. 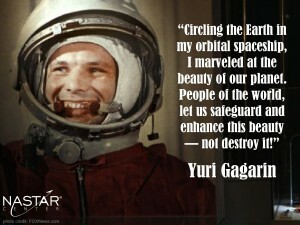 It marks the anniversary the first human space flight by Yuri Gargarin in 1961. What if we could repeat such a – previously deemed – incredible feat to apply our minds to help humanity thrive within the limits of our planet? We often hear astronauts talk about spaceship earth, like the late Dutch astronaut Wubbo Okkels. By being in outer space, they help us see the unique beauty of our planet – and its vulnerability and limits. Decades of exploring space through manned and unmanned expeditions has yet to help us find a second planet on which we can thrive. Besides making us more aware of planet earth’s vulnerability, space exploration has also brought us new technologies and the belief that anything is possible if we combine our brains and our hearts. It fostered a true space race among nations, that continues today. What if we could reapply that level of ambition and combine it with human creativity, technical innovation and dedication to find solutions for the most pressing issues of our time, starting with climate change? The next space race isn’t about finding that planet in another galaxy where we could potentially go if we exhaust this one. The next space race if about finding ways to live within the boundaries of our own space. It’s about viewing our planet as a closed loop system, where natural resources, clean water, clean air and arable land are not taken for granted. For the original space race, the challenge was mainly technical. For the new space race, the technology is mostly there. 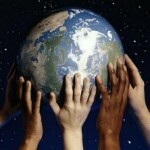 This time, as humanity, we need to work together to challenge our behaviors and beliefs. Written by Marjolein Baghuis (@mbaghuis) for Change in Context. To read about interesting people, book reviews and other posts about leadership, change and sustainability, please subscribe.